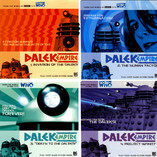 To mark Into the Dalek, Big Finish has made series 1 of Dalek Empire available for £15 on CD or £10 on download. That’s four CDs of Nick Brigg’s epic. Details here.